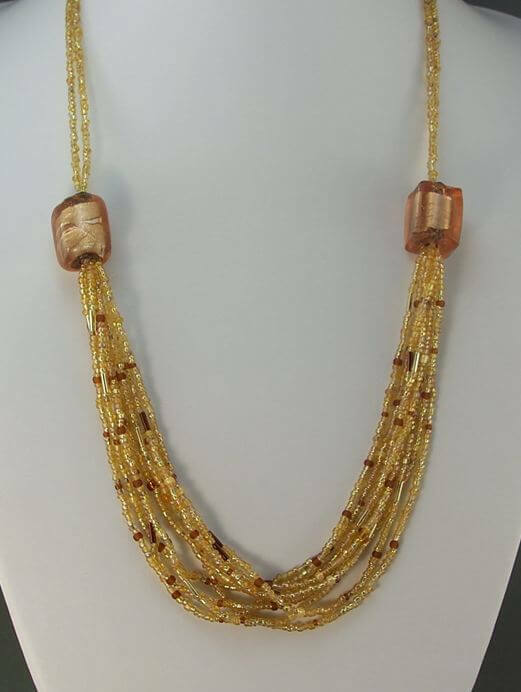 8 strands of seed-beads and bugle beads in assorted brown, gold and topaz colours form a soft drape from two large foil-lined glass beads. Two strands of stainless steel beading wire support 2 x pale Topaz coloured silver foil-lined glass lamp-worked beads from which 8 strands of multi coloured beaded thread softly drapes. Seed-beads and bugle beads in gold and topaz brown colours add to the versatility of this design. The seedbeads include matt, lined, translucent, AB, and bugle beads. This design measures approx 62cm and is finished with a copper coloured S hook and a 40mm extension chain. The central strands are beautifully soft and flowing, while the upper strands add strength and form.